I am exhausted by Israel. My exhaustion isn’t much compared to the humiliation and oppression of the Palestinians, who have withstood the forced conversion of the occupied West Bank into a skein of Bantustans and of Gaza into an internment camp—or an “open-air prison,” as it is sometimes called, because to call it anything harsher is to invite an apoplectic response, even from those liberal Jews who view Israel with disapproval. Exhaustion is insufficient, but it is difficult to escape when every conversation about what it is to be a Jew, regardless of your faithful observance or lack thereof, whether you keep the Sabbath or barbeque pork in the backyard on a bright Saturday afternoon, returns to the question of Israel, this distant, foreign country, a lodestar to some of us and a millstone to others, but either way a central and immediate concern to our Jewish lives. Theodore Ross Who's Afraid of Criticizing Israel? This spring and summer, Israel engaged in the indiscriminate killing of Palestinian demonstrators at the Gaza border. The victims included journalists and at least one medic. This is not the first time that Israel has engaged in indiscriminate killing, and it is unlikely to be the last. I do not believe we are going to convince this Israel government that Palestine is a place, let alone a nation. The relentlessness of Israel’s brutality has become impossible to ignore, and even many American Jews reflexively inclined to support Israel have at least come to admit, however reluctantly, that its actions are, in the weakly clinical turn of phrase, “disproportionate.” In the Jewish press in both America and Israel, there’s been an outpouring of worry about the growing disaffection of American Jews, especially younger American Jews, when it comes to Israel. Young Jewish voices are prominent in the Boycott, Divestment, Sanctions movement, which seeks to isolate Israel. Over the past year there have been several well-publicized incidents of Jews on “Birthright” trips, long a cornerstone of pro-Zionist education for non-Israeli Jewish youth, walking off their carefully curated tours to meet with Palestinians and to see how they struggle to live. These developments are salutary, and there is no doubt that American Jews in particular have a moral obligation to speak out, since so much Israeli policy is ultimately undergirded by American dollars and American arms. But I also worry about the powerful gravitational pull that this Jewish outpost exerts on our lives in the Jewish Diaspora, the harmful influence that this pull has on our conception of Judaism as a culture, as a religion, and as a people. 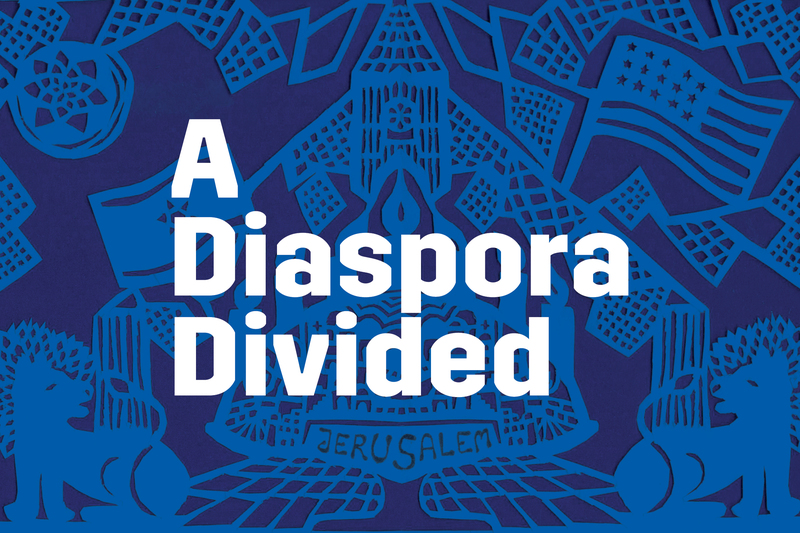 Modern Judaism is a religion of the Diaspora. Our customs, our prayers, our architecture, our cuisines, our nearly-lost European languages, and our many literatures were all born far away from Palestine. We became a European people and an American people, despite the many centuries of bigots who tried to say otherwise. When I consider my own Judaism, I think of my Russian and Lithuanian and Ukranian and German (and Spanish, even!) ancestors, who came at various times and places to the United States. I never consider with regret whatever imaginary forbearer of mine, two millennia ago, who perhaps pulled a cart and a mule out of some old Roman province toward the Central Asian steppes. The central question of Jewish life in America ought to be Jewish life in America, and I resent the moral necessity of endlessly calculating my position vis-à-vis the right-wing politics of a foreign government. I resent the necessity of even feeling anger and disdain, born of both American national policies and the centrality of Israel in Jewish-American life. How do we create an authentic and enduring Jewish community in America? This is a far more existential question to American Jewry than the question of whether the Hamas charter recognizes Israel’s “right to exist.” The decline of a communitarian Jewish identity in the United States is inextricably tied to a sense of ossification, a sense that the same murmured prayers are insufficient to the present moment, a sense that endless apologia for Israel have eclipsed our commitments to equity, justice, and community in our own country. These are the reasons so many young Jews have found themselves drawn into leftist politics, which address spiritual and communal longings to which their parents’ and grandparents’ Judaism no longer speaks. In the immediate future, American national policy toward Israel is unlikely to change. Ours is a reactionary right-wing government as well, and the convergent commitments of the GOP base and a staunchly pro-Israel Democratic establishment form a bulwark against any major shift away from the status quo support for the Israeli state and its policies of apartheid in all but name. The incipient challenges to entrenched Democratic Party leadership suggest the possibility of an alternate approach to Israel, but for the time being they represent only that: a possibility. Meanwhile, even as right-wing support for Israel has grown even more extreme, we see the return of an older, open anti-Semitism in the political coalition of the American right, a rebirth of the old calumny that Jews represent something foreign and subversive in the American body politic—long after Jews were admitted to the country clubs, after we became convinced that we were well and fully white. This, too, calls us back from our old, unquestioning views. We cannot depend on a foreign refuge, a refuge that is, ironically, walled against another people’s legitimate claims to freedom. To some extent, this is our real obligation—not to carve out a Jewish home abroad, but to defend the home that we’ve built right here.